The Food for the Poor website pictures children in need. Desperate children living in ramshackle huts. Malnourished mothers cradling gaunt infants in reed-thin arms. Distressing scenes of hopeless poverty in Haiti, across the Caribbean, and in Latin America. Such heartbreaking images have helped spur a windfall of money for Food for the Poor, one of the nation’s largest charities, which reported disbursing nearly $1 billion in aid in 2017. All of it delivered to “the poorest of the poor” with extraordinarily little overhead, the international relief group says in its appeals. That’s what church congregations in New England and elsewhere have been told from the pulpit by advocates for the ecumenical Christian group. That’s what hundreds of thousands of donors who contributed cash in 2017 believed, and what the charity continues to maintain. But it’s a far cry from the truth, a growing number of critics say. Food for the Poor, they say, greatly inflates its total donations by putting huge and questionable valuations on noncash gifts, like medicines. That has the effect of making its overhead seem deceptively small by comparison. The group’s cash gifts tell a very different story. Food for the Poor apparently spent 64 percent of its cash donations in 2017 on wide-ranging direct assistance that included housing, school supplies, and sanitation, according to its most recent financial statement. The remaining 36 percent went to salaries, fund-raising, and other overhead costs. And belying its name, the Florida-based group spent just 7 percent of its cash donations on direct purchases of food in 2016, according to e-mails exchanged between a charity official and one of the organization’s critics, who shared the e-mails with the Globe. These practices by the charity have sparked investigations and regulatory questions in at least four states and a cease-and-desist order from California’s attorney general, which Food for the Poor has appealed. But the scrutiny has gone largely unnoticed in the Boston area, home to the nation’s third-largest Haitian community, whose native country is the biggest recipient of the organization’s aid. The charity has solicited for many years in New England, often in churches where visiting clergy use their sermons to urge parishioners to donate. 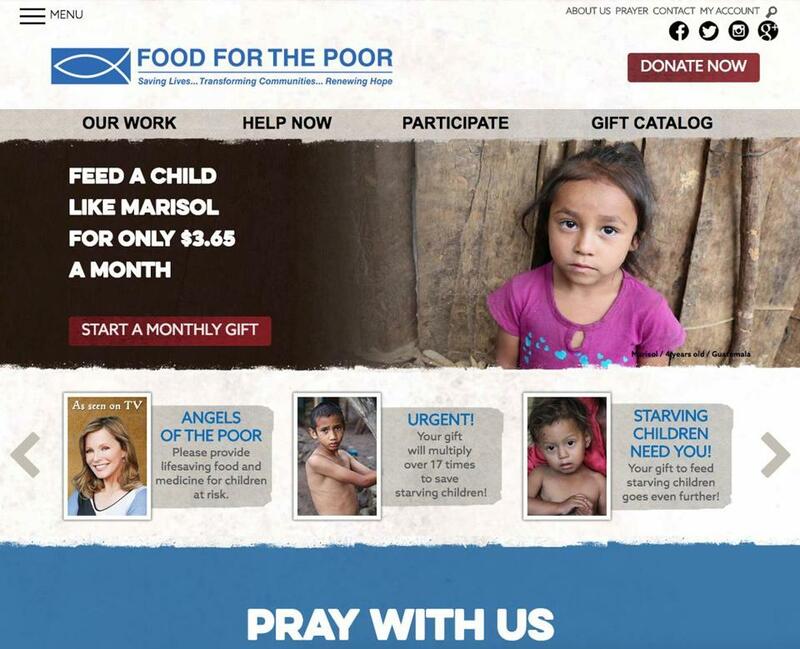 Food for the Poor also has advertised three to six times a year in The Pilot, the newspaper of the Archdiocese of Boston, most recently in March. The organization would not disclose how much it collects in donations in New England, and the Massachusetts attorney general’s office, which regulates charities in the state, said it does not have that data. Whatever its reach in New England — and it appears to be significant — Food for the Poor is competing for a limited number of charitable donations on what critics say is an uneven playing field. Food for the Poor adamantly denied any financial sleight of hand. And Angel Aloma, the charity’s executive director, said in an interview that the investigations are diverting attention from the good works it does. At issue is the charity’s practice of combining $800 million of in-kind gifts with its much smaller cash donations, obscuring the reality that cash gifts account for only about 15 percent of its revenue. Many of those in-kind gifts are medicinal drugs — some allegedly nearing their expiration date and barred from US distribution — that have been wrongly overvalued at US market prices instead of the far lower prices they bring outside the country, according to the California attorney general. For example, the charity used US prices when it placed a $924,671 value on a 2012 shipment of the cholesterol drug simvastatin to Nicaragua, according to the cease-and-desist order issued in March by California Attorney General Xavier Becerra. Its appropriate international price was less than $5,000, the order said, a reflection of the premium that US consumers pay for drugs. Pharmaceutical corporations say US prices are partly a product of research and development costs; critics say the companies charge sky-high prices simply because they can. In another case, Food for the Poor shipped the antibiotic ciprofloxacin and painkiller tramadol to Guatemala in 2013 at a stated value of $534,000. On the international market, the cost was less than $46,000, Becerra said. The California order, which accuses Food for the Poor of filing “false and misleading” financial statements and federal tax forms with his office, bars the charity from reporting that 95 percent of donations go directly to relief. Becerra is also seeking $1.09 million in penalties. Combining the two types of donations creates “a likelihood of confusion or misunderstanding in the minds of potential donors,” he said. Becerra also wants to revoke Food for the Poor’s charity status in California. The group, which can continue soliciting in California pending resolution of its appeal, collected $38.6 million in cash donations there from 2012 to 2015. The charity defended its marketing and bookkeeping methods. Aloma also denied that Food for the Poor ships drugs near their expiration dates, saying that most are shipped with more than a year remaining. Since its founding in 1982, the charity said, it has fed hundreds of thousands of people each day, built 124,800 housing units, and provided $14.3 billion in aid. The organization also said its accounting methods have been certified by independent auditors. That case has raised concerns in the Massachusetts attorney general’s office, which is watching the proceedings closely, said Chloe Gotsis, spokeswoman for Attorney General Maura Healey. And Charity Navigator, which evaluates US nonprofit organizations, recently cautioned donors of its “moderate concern” about Food for the Poor. Financial transparency is at the core of many questions about Food for the Poor, but one critic also criticized the kind and quality of some goods it distributes. Patrick Moynihan’s wife, Christina, a teacher at the Louverture Cleary School near Port-au-Prince, said she has seen crates at the charity’s Haitian warehouse that contain winter hats, gloves, and scarves; Rachael Ray diet cookbooks; and 100-pound bags of beans that the school’s cooks found riddled with stones. Aloma, who said shipments are tightly controlled, seemed startled by Moynihan’s report of mismatched goods and unacceptable food. News of the California cease-and-desist order came as a surprise to every clergy member and parish official in Massachusetts contacted by the Globe, all of whom praised the group. The Rev. David Mullen of St. Brendan’s Church in Bellingham said he was unaware of any criticism of Food for the Poor, which has dispatched a priest to the Roman Catholic church once a year for the past several years to solicit donations. The Roman Catholic Archdiocese of Boston declined to comment about the California order. “There is no coordinated relationship with this group at the archdiocesan level,” said Terrence Donilon, spokesman for the archdiocese. “Certainly, the focus of the work on addressing poverty, malnutrition, and related health issues is vitally important and something we should all be dedicated to helping to solve,” he added. Ruth McCambridge, editor of the Nonprofit Quarterly, based in Boston, said that inflating the value of donations has “long roots” in the charitable world. “If they overvalue those goods, they make their budget look bigger than it is,” said McCambridge.